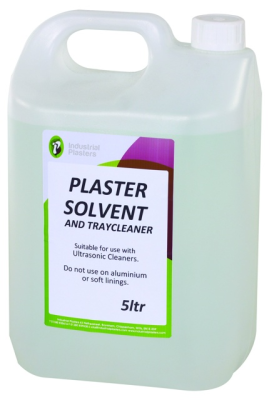 Plaster Solvent - Industrial Plasters Ltd.
Our Plaster Solvent is a very strong, yet safe to use solution, formulated for the removal of set plaster from trays, casts, tools and any other equipment. Widely used in the dental laboratories to clean trays; however can be used for a host of applications where our plasters are being used. Simply leave soiled item immersed in neat solution overnight, and ‘hey presto!’ all traces of set plaster turn to a mush, which is easily washed off with water. Can be used in industrial applications where irregular shapes are cast or formed in plaster and then a composite shell (mould, etc.) formed over it; the plaster can then be dissolved out by repeated flushing with plaster solvent. Plaster Solvent should NOT be used in contact with aluminium or soft linings. It also acts as an extremely strong retarder when mixing plaster, so great care MUST be taken not to leave any residue solution in containers or on mixing tools where fresh plaster is being mixed.